The Wissenschaftszentrum Berlin für Sozialforschung (WZB) is a German research institute dealing with basic social science research in an international comparative perspective. The work at the WZB is characteristically multidisciplinary and mostly empirical. The website of the Centre is an excellent tool for retrieving rich and detailed information upon WZB research areas and their units, about activities, researchers, publications, projects, project networks as well as events and latest advertisements of vacancies. 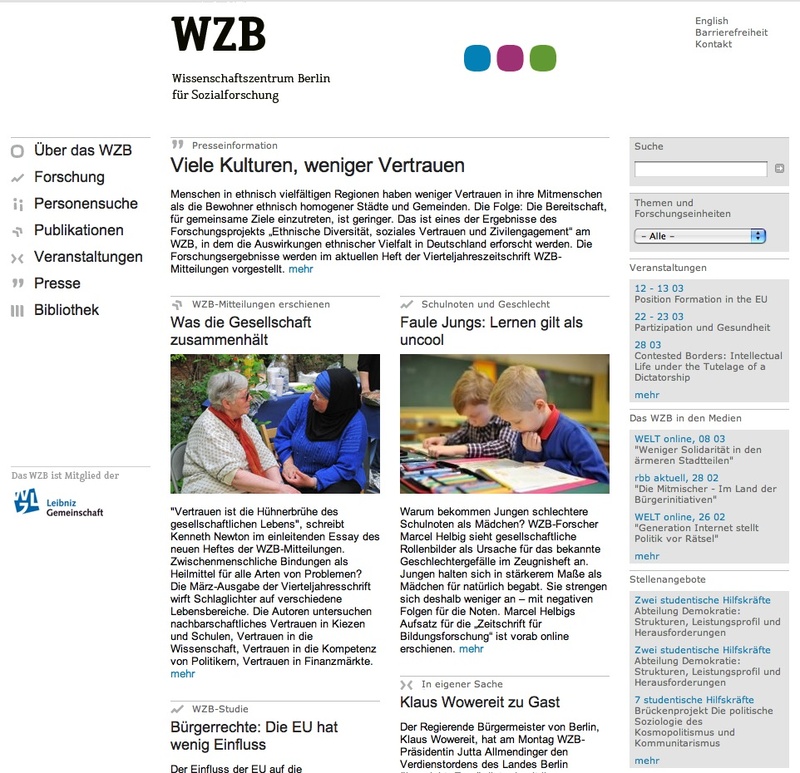 Though limited to the Institute’s activities (links to external website are rare), the site offers free full-text retrieval of all WZB produced materials (discussion and working papers, research projects and results) as well as downloading of reports on current research results, proceedings, publications, news about the staff (summaries in English) and biennial activity reports. Full-text files for all such sources are available in pdf format, while for other items (WZB-published books, lectures) only abstracts or lists are provided. Part of the material is available only in German, with almost one half of the WZB works also in English. Subscription to WZB newsletters is free, as well as browsing its online catalogue. presents a selection of faculties, schools and departments more active in the on-line presentation – and management – of Political Science teaching and research activities. With the aim of attracting students and scholars worldwide, promoting scientific results and publications, sponsoring seminars, lectures, and conferences and, often, creating special research programs and courses on-line.